As many of you know, my daughter Yumiko is a ballet dancer. She recently purchased a new pair of toe shoes - those awful contraptions that look so beautiful when a dancer knows how to go up "on pointe" with them. The problem with toe shoes is they are not only a pain to wear, they also are a pain to get ready to wear. I usually sew on the elastic straps and ribbons that are never pre sown. And as you all know, I hate to sew. But that is not the subject of this story. 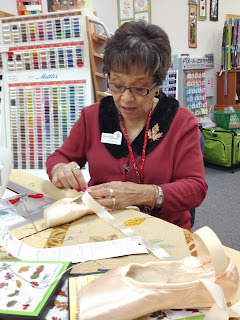 I did my sewing and Yumiko wore her new toe shoes to her Nutcracker rehearsal on Saturday. Not sure if I sewed them incorrectly, but the shoes were too tight and she had trouble dancing. The teacher was upset with her and called her out during practice. Yumiko explained that her new toe shoes hurt her feet and she needed to untie them and adjust the elastics. She had to do this in hurry as the entire class was waiting for her. She ran into the dressing room, untied the little elastic tie, cut the the elastic with a scissor and was about to tie them again, when the elastics retreated back into the seam of the top of the shoe - never to come out again! Oh what to do. Well she continued to dance without tied toe shoes. The next thing that happened was during a pirouette a shoe came flying off. The teachers were now really upset with poor Yumiko. Not a good practice and possibly a ruined pair of toe shoes. She came home and explained all this to me with a heavy heart. She felt badly we had spent all the money for the new toe shoes, but without the elastics they were useless. Today I called the ballet store where we got the shoes and although the proprietor was very sympathetic, she also didn't think there was much of a chance we would be able to fix the shoes. So.... being the technology wiz that I am, I googled "Help fixing problems with toe shoes, elastic disappears into seam." And what comes up, but a little store in King of Prussia, PA called "Steve's Sewing,Vacuum & Quilting" located at 268 West Dekalb Pike. I called the store and a nice woman said yes, she understood the problem, bring in the toe shoes. Well, I dropped Yumiko off at Ballet in Narberth earlier this evening and then made the trip to Steve's. I didn't have great expectations, but thought I might as well give it a try. When I got there a little after six, I found a marvelous gem of a store for anyone ever interested in sewing or quilting. Neat as a pin, chock full of all sorts of sewing equipment. The woman behind the counter introduced me to Ivette the angel and solver of all problems. Ivette Velez Grundy was out of this world. A beautiful woman with a heart of gold and a determination to fix my problem or else there would be hell to pay. She figured it out immediately, went through the store and gathered all the materials she needed - a little cutting tool, a long loop turner, new elastic thread, safety pins and a marvelous sense of humor and tremendous patience. While I sat there, she gently opened up the little seams of the toe shoes, fished out the old damaged elastic threads, rethreaded new threads and handed over the brand new perfectly fixed toe shoes. I was blown away. Such kindness, such grace, such customer service. And the charge was $6.29. I told Ivette I was going to write about her in this blog and that I would include a picture of Yumiko in her brand new toe shoes. 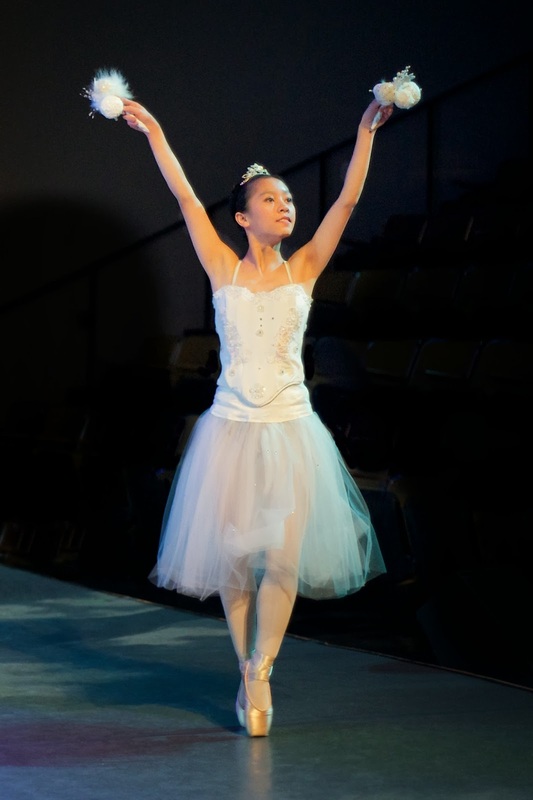 Well Yumiko isn't home yet, so I am including an old picture of Yumiko in toe shoes and when she performs in the Nutcracker at Upper Darby's Performing Arts Center in those new shoes later this month I will post yet another picture. Thank you again so much Ivette. You are an angel. Thank you Kitty I was glad to help you in your time of need. I have no daughter only 3 sons two of which I lost this past year. They had wonderful people helping them in their times of need so I vowed I would repay the good souls by helping others in their memories. Please come by the store soon and Yumiko is absolutely stunning !!!!!!!! May God Bless her every step as she dances. Thanks for the wonderful message. Oh Ivette - it is people like you that make this world a miraculous place. Thank you again. I felt blessed as I came out of your store and Yumiko will be blessed dancing in your shoes.